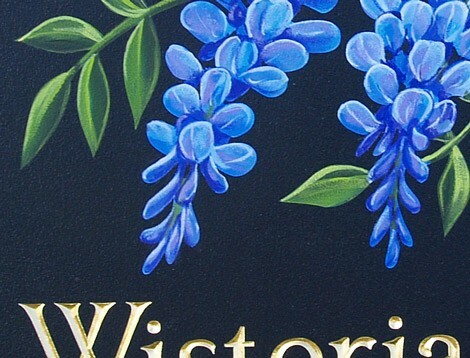 WISTERIA IS AN ESPECIALLY striking climbing vine in the pea family that is native to the eastern United States and Canada as well as Japan, Korea and China in the far east. This plucky plant twines itself around anything that will support it, climbing as high as 20 meters above ground. Some extraordinary examples are found at Ashikaga Flower Park in Japan, where the plant dates back to 1870 and as of 2008, and covers half an acre. An even larger wisteria in Sierra Madre, California, planted in 1894, measures more than an acre and weighs in at 250 tons! 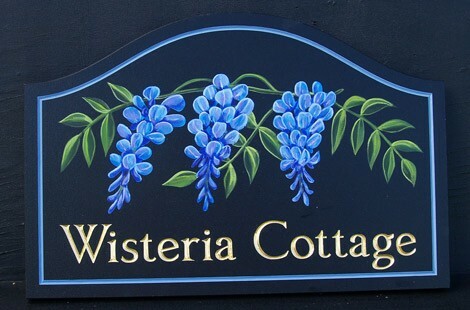 The wisteria on this beautiful cottage sign in Nova Scotia, Canada is hand painted directly on the sign surface. The artwork was chosen out of approximately 1,000 options on Danthonia’s sign designer, where Susan was able to pick her favorite – or opt to have her own custom artwork on her sign design. The sign shape, corners, colors, font, texture, size, edging and rendering were all her choice and she was able to see the price as she went along, so there were no surprises at the end and she could work to her budget. She could also save as many design revisions as she wanted, and send them to friends for their feedback (if she wanted it!) When she was ready to go, she just added her design to the cart and ordered her sign online. A refined design proof was then emailed back for her comments and final approval before the sign was put into production. Two weeks later, a photo of the finished sign was sent and the sign was delivered a week later. 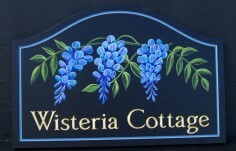 24 " x 16 "
Thank you so much for my beautiful Wisteria Cottage sign! I can say that it is everything I hoped for. 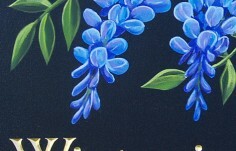 The wisteria flowers and wording are beautiful and will certainly enhance the cottage.